Cattails can quickly ruin a pond's visual and recreational benefits. Control is best achieved through disruption of the root system. Cutting cattails 2 or 3 inches under the waterline 2 or 3 times to drown them can actually stimulate them if done in May. Pulling them out by the roots can be impractical. We recommend using a Glyphosate 5.4 Herbicide and a surfactant for easy control without digging up the landscape or concern over maintaining water level. Using our treatment method, herbicide travels throughout the plant killing both the roots and vegetative portions. Simply spray on the portions of the cattails that can be reached. There is no need to spray from multiple directions. Contact us at 1-877-428-8898 for application tips regarding timing, affects of weather, results, and more. The catkin fruit, or seedhead, is green during early summer and turns brown and fuzzy in the fall and following spring. The cylindrical flowerspike catkin can be more than a foot long resembling a hot dog, making the cattail easily distinguishable from similar plants. Cattails are perennial wetland plants found growing above the surface of the water in marshes, ditches, shoreline shallow areas of lakes, ponds, slow streams, quiet water up to 4 feet deep, and seasonal flood areas. Although widespread throughout most of North America, Europe, Asia, and Africa, cattails are not likely to grow in depths exceeding 18" to 24" or areas not wet most of the growing season. Cattails are colonial plants rising from creeping stems (called rhizomes) like a branching shrub on its side. 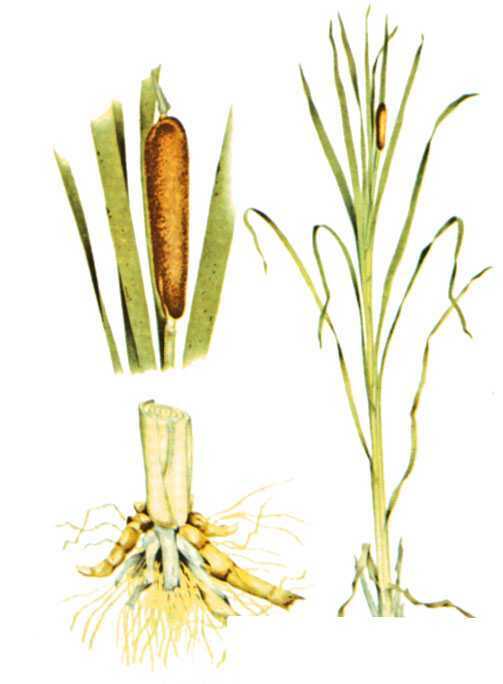 The creeping rootstock of undergound rhizomes is one means of reproduction to rapidly spread cattails locally while the seeds are another way cattails establish new colonies. Cattail seeds germinate in April and plants mature from July through August. For easy cattail control, we recommend our Cattail products.